will do but first I have to make myself a sandblasting cabinet after getting fed up relying on others I've decided to do the bckts and bits'n bobs for the Bedford myself, but will let you know of my adventures with tubes soon. It must be time for another update on progress. Work on and around the cab area is nearly complete with the instrument housing is repaired and waiting for a top coat. It’s taken some time but I managed to track down a full set of suitable instruments (trial fitted for the photo) the ignition / light switch is a NoS unit, it’s post war but I’ve fitted an early brass turn key, I still have to fit a brass bezel for the warning light fortunately I have a couple that can be cleaned up the only difference then will be the number of rivets in the face and possibly the part number but I can live with that. A significant piece of kit that was missing from the truck was the spare wheel carrier so it was now time to turn my attention to this. 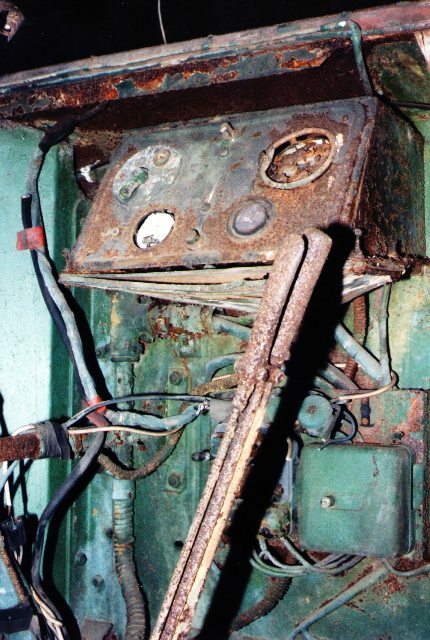 Studying in service and factory photos showed that two types of carrier were fitted to the Retriever. From the start of production to mid1940 a bow type structure was used to support the wheel then from mid1940 to the end of production in November 1941 a simple angle iron ladder and rack was fitted. My truck should have the bow carrier fortunately the truck that was in the defunct Beverly RCT museum and Monty’s caravan at IWM Duxford both had the early bow system so these were used to produce drawings and scaled photos. The problem of bending some fairly heavy gauge pipe was solved when a post war carrier turned up it may possibly have come from an AEC Militant but I’m not sure. The problem was it was too tall had extra inertia brake fittings, the tubes were joined with a solid web and the hub was a four arm carrier as opposed to the original two arm……apart from that it was perfect….. hmm that’s a good buy then :???. 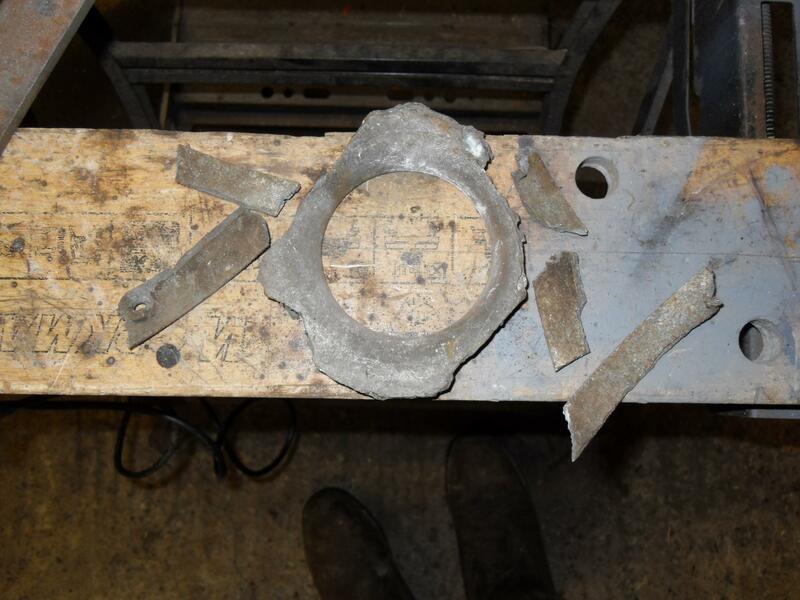 The result was several days with my petrol cutter and an angle grinder. That did the trick, I did ponder changing the hub to a two arm configuration but decided I’d live with it the way it was. Next job was to fabricate the frame work that the carrier pivots in and attaches the whole assembly to the truck this is an angle iron and steel plate construction. Next the hinge locking plate was bent up and drilled and filed out to take the bow pivot pins (that’s the bar in the lower front of the photo that joins the two angle irons) The side irons were mounted on the truck and the flat bar cross braces cut, drilled and added….. it was beginning to look a bit more like it, all be it still very wobbly. The wobbly problem is cured by the addition of the steel plate cheek pieces these bolt onto the fuel tank support angle irons and are cut from 5mm plate. They are a distinctive shape so a cardboard template was made up and adjusted until it fitted properly. The rails were then taken off and drilled to take the rivets that hold the cheek pieces on. The cheek pieces were then hot riveted onto the rails, the originals have a distinctive head shape on the outside and appeared to be machine closed on the inside face (no snap used apparently) after searching various catalogues the nearest to the shape and size I could find was on a long shank black iron coach bolt. So out with my machinists digest to work out the correct rivet length required cut the threaded portion off along with some of the unwanted shank then repeat 30 times. The cheek pieces were then hot riveted on using the anvil to hold the head, the Oxy torch with fine nozzle to heat only the rivet shank to just short of melting then thickening up the shank and dressing down with a medium weight ball pane hammer. Its been an absolutely marvellous restoration considering what you started out with. I just have to sit and admire your enthusiasm and dedication to the project which surely must be recognised. I so look forward to seeing more of your innovations and the total revival of the rare vehicle. it's very much a labour of love to do this commercially for a customer would not be viable. But I'm doing this for myself and have a family connection with the type so it's always a pleasure to work on. As you can can see I take one bit at a time and treat it as a project in it's own right, I find that way it focuses both effort and funds and prevents getting overwhelmed by the amount of work still to do. Each separate project completed is a step nearer to the finished whole............. pleased your enjoying the thread. A wonderful restoration, takes me back thirty years when I did this stuff. The thing to do, as you are doing of course, is just keep completing jobs and when there are no more to do then it is completed. Well done keep at it ! I have just read through this thread again and it is a true labour of love. Great project, great workmanship, keep the post coming. Thank you Bob and Peter for the positive comments, they are very much appreciated. When I've completed the top section and locking assembly I'll post another update. Currently I'm converting my old slurry pit into a large workshop so it may be a couple of months before I return to this thread. Found some time over the last month to finish the spare wheel carrier so here's a few photos showing the construction of the locking mechanism and the return pulley and bracket. This part of the build was mildly challenging as this bit was built entirely from photos, it not only had to look right but had to function correctly to ensure that it doesn't pole axe any one when the wheel is lowered, all in all I'm pleased with the result. Return roller bracket, roller and cable installed and spare wheel carrier arm refitted to try out the operation no one crushed and the arm didn't bury itself in the workshop floor.......result !! As others have said, great work and don't stop doing it or posting how you are getting along, many are watching. Thanks Robin, small steps but it's coming along. The next major item will be the overhaul of the intermediate axle. Time for anther update, progress has been slow over the winter due to a combination of a cold workshop and a good wood burner in the house . Having said that I have dug the intermediate axle out of the barn and moved it into the workshop ready for cleaning and strip down a few more pictures of work on this item will follow in due course. I had to undo the pivots, anchors and wheel cylinders on each side to give some free movement if and when I could un-stick the shoes then with a combination of very controlled heating tapping and rotating the drum a fraction back and forth at last they came off and despite the effort needed to remove the drums the condition inside was not too bad. As a bit light relief from the fight with intermediate axle I decided to make the Vokes air filter case that fits under the floor boards on the mates side of the cab. The cast aluminium end plate that the bellows are fixed to was also broken some of it missing and only six pieces remaining and unusable. This is going to sound like a Christmas cracker joke......What can you make with an aluminium saucepan, a sheet of steel from an old washing machine and a scaffold tube?...... answer a Vokes air filter case. Using the scaffold pole like a rolling pin and the workmate set to an increasing gap the sheet is slowly worked into a curve more to follow. The last thing to do was bend up a the support bracket for the air cleaner from 2.5mm steel sheet this bolts to the frame of the truck and the air cleaner sits on top of the bracket. I'm not up for the epic sowing session undertaken by the Rampant Rivet to reproduce the felt and wire bellows this really was a work of art on his part, so I'm opting for a modern truck filter of the correct air flow for the engine capacity and it will fit inside the housing, it wont be seen when fitted and will do the job well. Impressive work, .......... will make the raw potatoes go down a treat :cool2:. Seriously very good though. When I stole a wok to make a sump I was quite up front about it! This is a busy time of year for us but I have found some time to make a set of inlet and exhaust manifold gaskets. Having had no luck finding a set to match or finding a company that would do a small volume run at anything less than eye watering prices I set to and have made my own from 2mm Klinger stainless reinforced sheet bought off e-Bay for a little under a tenner post paid. Time an update on progress. Following on from making the manifold gaskets the next logical step after fitting the manifolds was to look at the exhaust system. The original is all 2.5” dia pipe with a large diameter silencer box just over 3’ long. The pipe was no problem as an excellent company called Jetex supply all sorts of useful pipe and fittings in a wide variety of sizes for the Custom Car and Hot Rod world but finding a silencer of the correct proportions was not so easy, it’s very visible so it needed to be correct so I set to and made one. The expandable Acousta-fil wadding wrap from Demon Tweeks being fitted prior to loading into the outer can and welding closed. This wadding is fairly new to the market and expands to fill the available space when run up to operating temperature, much cleaner and easier to use than the old glass fibre and steel wool methods it’s highly recommended. Flexible couplings for the shaft drives on the dynamo and water agitator made and fitted, these were made out of Balata belting I thought initially that these would be the Layrub type however there is not room for that type of coupling and the parts book records them as ‘Flexible belt couplings’ the whole thing lines up perfectly using the belting so it looks like it was the right choice. The red edges on the flexible drives seals the cut fibers of the belting I used Hammerite red the traditional colour for this is either red or orange so it looked OK and did the job well. After that first start and 4 minute run it has run now for a total of 15 minutes, the inhibiting oil has burnt off and the wadding has expanded and stopped smoking in the silencer box as a result it seems to be a fair bit quieter now. Iv'e adjusted the idle speed a little and the timing seems OK for now, the manual advance on the magneto gives up to 40' advance so there's plenty of margin. 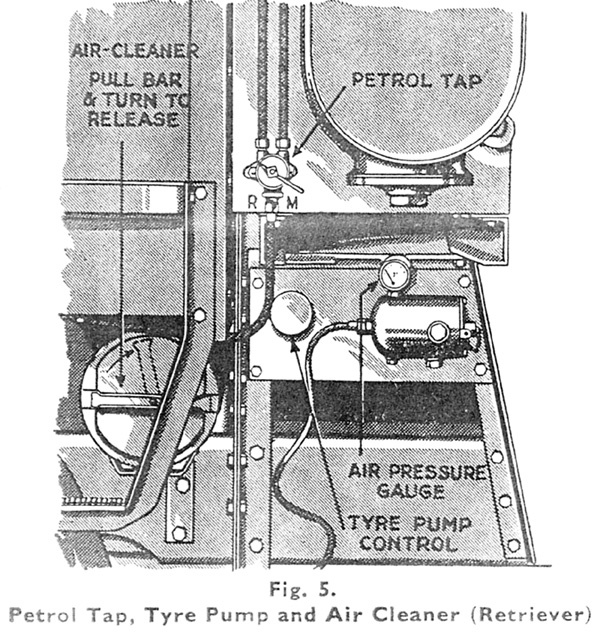 Static timing is achieved by setting the engine to TDC on the handle (Thanks Agent 'O' for the cranking action) both valves closed on N01 with N04 on the rock, then it's underneath to mark the flywheel which then has to be turned back by a specified amount for each individual engine this value is given on a brass plate attached to the valve cover in this case 7/8" measured on the flywheel rim this gives optimum valve timing with the magneto in the fully retarded position with the points just about to open.......All good stuff !! ( still grinning) .